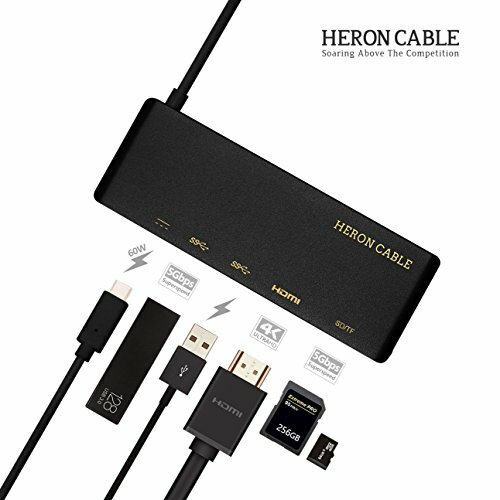 Heron Cable 6 in 1 multi-function USB C Hub helps you increase productivity through high-speed data transfer and 60W power delivery and provide you a comprehensive peripherals for all compatible devices. It does not need external drivers or software, just Plug-n-Play! USB Type C female port: 60W power delivery and data transfer speed up to 5Gbps. USB 3.0 Type A port: 2*USB 3.0 port, data transfer up to 5Gbps. Compatible devices: MacBook Pro, MacBook, Google Chromebook Pixel, Dell XPS/Inspiron/Alienware, Asus ZenBook/VivoBook, Lenovo ThinkPad/Yoga, Samsung 8/8+/9/9+/Note, Huawei Mate10/Mate 10 Pro and other USB Type-C devices. Note: Heron Cable USB C hub lets you connect your Galaxy S8/S8+/S9/S9+/Note8 and Mate 10/Mate 10 PRO to a monitor use the HDMI port, it will display it on the big screen and enjoy watch photos and videos with your family and friends. The Heron Cable 6-in-1 USB Type-C Hub Adapter is equipped with 1x USB 3.1 Type-C port, 2x USB 3.0 ports, 1x 4K HDMI (30Hz) video output as well as a SD card slot and TF card slot. Instantly expand available outputs and greatly increase the usability of your USB-C device. 60W Power Delivery: The hub's USB Type-C port can charge and data transfer with your laptop or other Type-C devices while simultaneously using other hub functions. HDMI 4K (30Hz) Video Output: Stream 4K@30Hz / 2K@60Hz/Ultra HD or 1080/720p video to a monitor, projector or TV. SD and TF Card Slots: Compatible with SDHC, SDXC, micro SDHC, and micro SDXC cards (SD and TF cards are not included). If you have any questions about this product by HERON CABLE, contact us by completing and submitting the form below. If you are looking for a specif part number, please include it with your message.